One of the acknowledged art forms of Cambodia is that of silk textiles called ‘sampot samloy’. 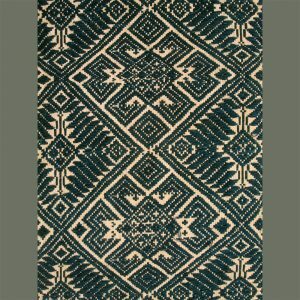 Made of the finest, most sensuous silk threads, and dyed in rich, often natural colors these glorious textiles have only recently been studied in depth. Even with recent scholarship, there remain mysteries about their history, materials and production, some of which are due to the culture’s tragic interruption and decline in the 1970’s.We do know that these cloths were produced for ceremonial purposes with many intended to be worn by men as lower body wraps called ‘chawng kbun’ at ordinations and weddings. A small number of cloths, called ‘pidan’ (literally ‘ceiling’ in Khmer) with special figurative designs were apparently not used this way, but rather as ceremonial canopies in temples. 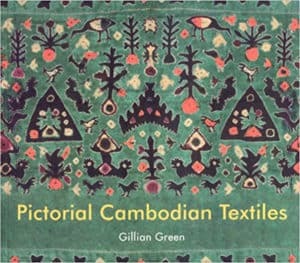 A recent publication by Gillian Green, Pictorial Cambodian Textiles, concentrates on the ceremonial textiles with imagery both figurative and stylized, and provides new information about these unusual textiles. 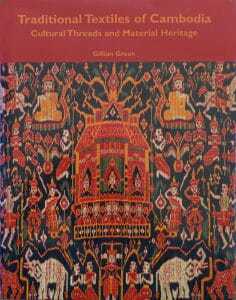 Of the “pictorial” ceremonial textiles, there are four categories: those with Buddhist themes, those with end-of-rainy-season themes, funerary textiles, and textiles for marriage and ordination. According to Dr. Green, documentation for this art form is minimal and only by studying evidence of other disciplines and cultural contexts can we better understand these textiles. 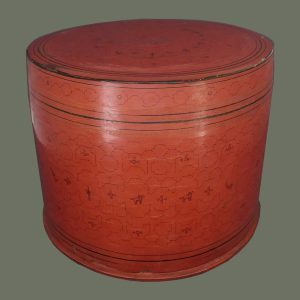 Existing documentation dates them from the latter decades of the 19th century through the first half of the 20th, with many being produced in the early part of the 20th century. 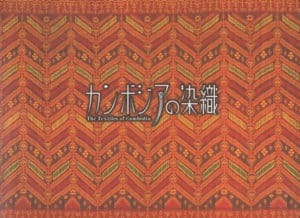 Thanks to new commercial and artistic incentives at that time, in the form of Palace-sponsored ‘tang tok’ celebrations of indigenous arts and crafts, the founding of the School of Cambodian Arts, and numerous international expositions these cloths were woven in larger numbers and with more imaginative imagery. 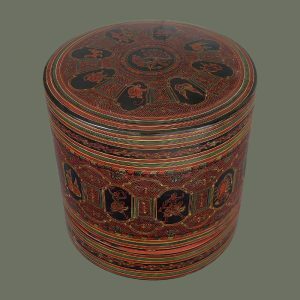 The increased production did not diminish the quality, but enhanced it as the competitions required only the finest items. More also needs to be learned about the materials- the silk and dyes used in the production of the works; while natural dyes are in evidence, so are synthetic ones, and sometimes in the same piece. Sadly, much of this information may have been lost with the passing of generations. Today the cloths of old are being studied and replicated by a new generation of master weavers who may be able to unravel the mysteries of the past and give us new insight. These have not been easy to photograph due to their size, and the lovely sheen of the silk is not apparent. If, after viewing the photographs, you have any questions, please ask. We welcome your interest. For photographs and commentary of our trip to Mr. Kikuo Morimoto’s IKTT and ‘Wisdom of the Forest’ in Siem Reap, Cambodia, please see our blog posts HERE and HERE. Enjoy this visual feast of Cambodian treasures!